Anyone planning a mountain bike transalp challenge in the European Alps can now use a transalp route planner based on Google Maps. While there are already a lot of outdoor route planning sites in general, the MTB-Transalp site we launched at outdooractive last week, is specifically aimed at people who want to plan a mountain bike transalp trip. Based on an underlying 14.000 km track network of selected transalp trails, users can put together an individual route. The site is in German language only, but you can watch a Transalp Route Planning Video on our related blog post, to get an idea about how it works. Anyone, who has used the point-click-drag-n-drop interface from Google Maps to plan a trip by car, will appreciate the same basic functionality, which is also available for the Transalp Route Planner. 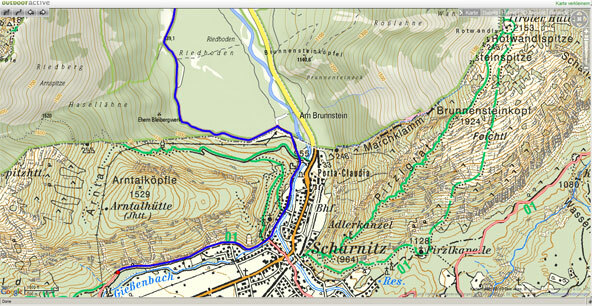 Since Google Maps is still ill-suited for decent planning in offroad areas, we have added a nice outdoor map with special cartography for Germany and a standard topographic map for Austria, which will both give you more details as a basis for planning in the offroad areas. An elevation profile of the route shows you information about the expected quality of the track surface and highlights the areas where you will have to walk your bike. Once you have put together your route, you can export a GPS (GPX) track of your individual transalp tour to take with you on the trip. There are also export options for PDF that will give you a print-out map if you don’t like GPS devices or you just want to back up your digital devices with a printed map. If you want to explore your transalp route in 3D, you can do this by switching to the 3D-View – this requires the Google Earth Plugin to be installed – or loading the GPS track into Google Earth. Note, that this may not work for all routes at this stage yet, as we are still resolving some issues to optimise performance for long tracks with many route points. If you don’t like to put together an individual route you can also select from predefined Transalp Routes. Here, our editorial team has put together some very cool routes with detailed descriptions, photographs, GPS track, elevation profile and all sorts of other information about interesting places along the routes. As an alternative to the outdooractive Transalp Route Planner, you can also try the following site, which also lets you plan a transalp trip by putting together predefined route sections. So start planning, get fit and then explore and discover your personal Transalp challenge! Dieser Beitrag wurde unter Transalp Route Planner abgelegt am 1.3.2009 von admin.